At that time the World-Honored One emitted a great bright light from his entire body, illuminating as many Buddha-lands as there are grains of sand in hundreds of thousands of millions of Ganges Rivers. With a great sound he spoke to all the Bodhisattvas, Mahasattvas, from all these Buddha-lands, as well as to the gods, dragons, ghosts and spirits, humans, nonhumans, and others, saying, “Listen as I now praise and extol Earth Store Bodhisattva, Mahasattva, who manifests great and inconceivable awesome spirit and compassionate power to rescue and protect living beings wherever they encounter misery and suffering. After my extinction, all of you Bodhisattvas, Great Beings, and all you gods, dragons, ghosts, spirits, and others should practice expedient devices for the sake of protecting this sutra and causing all living beings to testify to the bliss of nirvana. 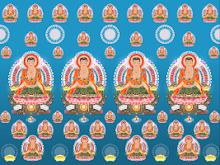 The emission of light from the Buddha’s entire body indicates the importance of this sutra. The great sound with which he speaks leads all living beings who hear it to be joyful, even though it is as great as resounding thunder or a lion’s roar. The sound is so pleasing, like the clear ring of a toned brass bell, that those who hear it enter the Dharma-hearing Samadhi. There are Five Blessings discussed in the section of the Book of History called the “Great Plan.” The first of these is called “blessings and longevity.” “Blessings” indicates a quality of comfort and ease, while “longevity” indicates life to an old age. These blessings are threefold: wealth, revenue, and long life. The first of these, wealth, refers to the goods that come to one naturally; the second indicates that which comes through a salary or other source of income; and the third is simply a protracted lifespan. If one has these three advantages, he is said to have blessings. In China, when people think of longevity, they think of Nan Chi Ts’e, who had an extremely high forehead and no hair. Within his mind were three heavenly books, and he was able to know almost everything. The second of the Five Blessings is “riches,” which includes both wealth and honor. The third is “soundness of body and serenity of mind,” the fourth is the “love of virtue,” and the fifth is “life crowned with good end” – in other words, a peaceful death. In addition to the Five Blessings, there are Five Virtues. The first of these is “warmth,” that is, being neither too cold, like an immobile statue, nor too warm, like a playful flirt. The Superior Man is warm when there should be warmth; he laughs when there should be laughter, and he speaks when there should be speaking. To be thrifty is to avoid wasting a single thing, to economize wherever possible. If, for example, we usually eat five bowls of food, we might economize and eat only three, thus saving two bowls for those who do not have anything themselves. One ought to be thrifty with respect to his own person and also with respect to his merit. It is not a good idea to have much food, to own many clothes, or to have too large a place to live in. Always be sparing. The fifth virtue, “yielding,” is the quality of always letting others go first and always being polite. Long ago in China there was an official named Kung Yung, to whom the proverbial phrase, “Kung Yung yielded the pears of four,” refers. When Kung Yung was a little boy of four, a visitor came to his home and brought a crate of pears. All the children in the household were summoned together and allowed to choose a pear each, and Kung Yung deliberately sought out the smallest of the lot. When questioned as to the reason for this action, he replied that since he was the smallest, he should take the least amount and leave the rest for his older brothers. Another saying, “Huang Hsiang warmed the sheets at nine,” refers to a boy who dutifully warmed his parents’ cold sheets before he himself would go to sleep. Both of these show virtuous conduct which embodies the Five Virtues. The Buddha told the Bodhisattva Universally Expansive, “If in the future good men or good women hear Earth Store Bodhisattva, Mahasattva’s name, worship, and fix their gaze on him, they will overcome the offenses of thirty kalpas. 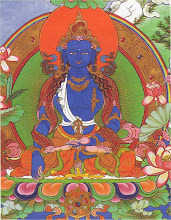 Universally Expansive, if good men or good women paint, draw, use earth, stone, lacquerware, gold, silver, brass, or iron to make this Bodhisattva’s image, gaze at it, and bow but once, they will be reborn one hundred times in the Heaven of the Thirty-Three, and will eternally avoid falling into the Evil Paths. If their heavenly merit becomes exhausted and they are born below in the human world, they will be powerful kings. Gazing at the image means to stare reverently, as if forgetting everything else, much as people in love stare at one another. The good retributions for cultivating such practices include rebirth as kings, and from this we should realize that those who are kings and presidents in this world are all persons who have worshiped Earth Store Bodhisattva in the past. 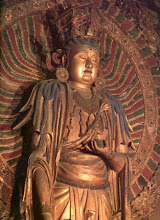 “If there are women who detest the body of a woman, and who full-heartedly make offerings to Earth Store Bodhisattva’s image, whether the image be a painting or made of earth, stone, lacquerware, brass, iron, or some other material, and if they do so day after day without fail, using flowers, incense, food, drink, clothing, colored silks, banners, money, jewels, and other items as offerings, when the female retribution body of those good women is exhausted, for hundreds of thousands of tens of thousands of aeons they will never again be born in worlds where there are women, much less be one, unless it be through the strength of their compassionate vows to liberate living beings. 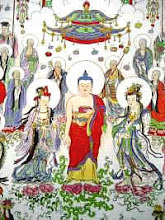 From the power of the meritorious virtues resulting from these offerings to Earth Store Bodhisattva, they will not receive the bodies of women throughout hundreds of thousands of tens of thousands of aeons. There are Five Obstructions and Ten Evils encountered by women. First we will discuss the Five Obstruction. The first is that women are not able to become the Great Brahma Lord because that position is accomplished through purity, and the body of a woman has a great many impurities. Second, women cannot become Sakra. An astute student may object that earlier we discussed the thirty-three women who became lords of the heavens of the Thirty-Three. This objection is a valid one, but it should be realized that upon reaching the heavens their bodies became male, because only males can be lords of the heavens. 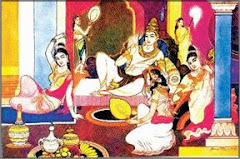 Although Sakra has some desire remaining that desire is quite light; women; on the other hand, are extremely libidinous and consequently cannot become Sakra. Third, women cannot become demon kings. This is not too bad. They cannot attain this position because demons are extremely hard, solid, and firm, while women are extremely soft and weak. As soon as anything unusual comes up they are at a loss and have to seek help. Fourth, women cannot be wise wheel-turning kings – the gold, silver, copper, and iron wheel-turning kings – as long as they have female bodies. Wise kings have hearts of great compassion and kindness; they teach people to maintain the Five Precepts and the Ten Good Deeds. Whenever women see something good occur to others, they become jealous, and this keeps them from having great compassion. Because of this basic problem, they cannot become wheel-turning kings. Fifth, they cannot become Buddhas. Buddhas have ten thousand virtues; women have many evils. They are jealous and obstructive, and their hearts are about the size of a sesame seed. If, however, women are able to rid themselves of jealousy, desire, weakness, defilement, and of all evils, they may become men, and so theirs is not a hopeless plight. There is, for example, the case of the dragon king’s daughter. 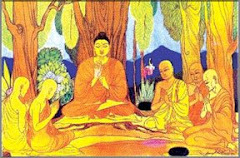 When Sariputra said that she could not become a Buddha, she took a precious gem, her most valuable and cherished possession, and offered it to the Buddha, who accept it. 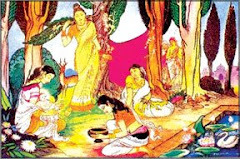 She then asked Sariputra if the Buddha’s acceptance of her offering was fast, and he replied that, indeed, it had been quick. “I shall become a Buddha that quickly,” she said and then she became a Buddha. This is proof that women’s lot is not hopeless. All they must do is resolve to cultivate courageously and they too can become Buddhas. The second evil is that raising daughters is not a very interesting task. The third is that women are always afraid of people. Boys are not usually afraid, but girls almost always are. The fourth evil connected with women is that their parents undergo a great deal of worry about their daughters’ marriage. In America this is not a major matter, but in most other countries parents have to give a great deal of consideration to finding good husbands for their daughters. The above nine evils apply to women in their youth. They are old when the tenth arrives and their own children and grandchildren slight them. As the proverb says, “To be old and not yet dead is to be a rascal.” These are only a few of the many problems involved with being a woman. To explain all of them in detail would be an unending task. Beings who truly cultivate will be reborn as women only if they have made a vow to appear in that form in order to teach others. Even though a woman may now think that she does not want a woman’s body, it is possible that it has been obtained through vows made in the past. Consequently, you never know which of you now studying the sutra might be here as a woman because of such a vow. 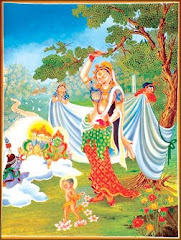 The Buddha’s mother, the Lady Maya, for example, roams at play among beings by means of the Samadhi of Great Illusion and has made the vow to be the mother of all Buddhas. The Bodhisattva Avalokitesvara, Who Observes the Sounds of the World, is neither male nor female but knows that men enjoy beautiful women and is manifested in such a body for the sake of teaching them. Although he is manifested in the body of a woman, Avalokitesvara is not involved in emotional states and is never affected by them. This method of teaching should be studied and applied, for if one is to rescue beings, he must lead them out of suffering and not be pulled back by them to flounder in the sea of suffering. One who is affected by greed for his environment, and by pleasure found in emotions, is confused and lacks samadhi. When Avalokitesvara is manifested in the body of a woman, he is never defiled by emotion, and his practice of kindness and compassion thus is genuine loving and is protective of beings. “Moreover, Universally Expansive if a woman who dislikes being ugly, vile, and prone to sickness gazes at and worships an image of Earth Store Bodhisattva with a sincere mind for even the space of a single meal, throughout thousands of tens of thousands of aeons she will always receive a body with full features. If that ugly woman does not dislike the body of a woman, during hundreds of thousands of ten thousands of millions of lives she will always be a royal woman or the concubine of a king, the wife of a minister of great family, or the wife of an elder, and be upright with perfect features. Such are the rewards for beholding and worshiping Earth Store Bodhisattva. There are Ten Bad Deeds that cause women to have an ugly appearance. The first is being fond of anger. While there are some women who do not often become angry, many fly into a rage over as small a thing as a needle, and, what is more, they enjoy it. The second reason for ugliness is doubt and gossip. Full of doubts about everything, they constantly talk about how they are mistreated; in this way they constantly spread hateful gossip. The third reason for their ugliness is that they like to lie and confuse people. The fourth is their delight in stirring up trouble. The fifth is their lack of respect for their parents. This, of course, is just a generalization; but while there are a great many who do have respect, many do not. The sixth is that they are disrespectful in holy places, in temples, or in places of those who have cultivated and certified to the Way. The seventh is that they like to appropriate the property of the sages for themselves. The eighth is that they like to extinguish the lamps lit before the Buddhas. Although there are not too many who would do this, it does happen and it brings forth the retribution of ugliness. The ninth reason is that they belittle and look down on those who are ugly. Although you are unaware of it, there is something in the nature of things that acts like a camera. When an ugly person is maligned for his appearance, a picture is taken and stored until the next lifetime when the one who looked down on another becomes ugly himself. The tenth reason is that they like to learn every possible variation of bad conduct. These are the ten causes for ugliness among women. There are also ten reasons why women are sickly. The first of these is beating other living beings. The second is exhorting others to beat living beings, telling them, for example, to hit cats, club dogs, trample mice, or beat children. The third is praising the practice of beating and telling others how good it is. The fourth is taking delight in seeing others beaten. The eighth is that they become jealous when a doctor cures a patient and sometimes even wish that the doctors would disappear. The ninth is that they hope the sick will remain invalids and never be cured. The tenth reason is incessant eating. Before they have finished digesting one meal, they are back eating and never stop. If it were not for the above twenty kinds of bad conduct, the women discussed here would not be ugly, vile, and prone to sickness. In a body with full features, every organ looks as it should; the ears are shaped like proper ears, the eyes like eyes, and so forth. It might be objected that eyes are always eyes and won’t look like anything else. This is true, but here we are speaking of features that are shaped properly. Some eyes are very square shaped, and others are triangular; some ears are well shaped and some are pointed. Among other things, a person’s face reveals his merit. If the nostrils are exposed, a person has little merit; if his eyes are triangular rather than almond-shaped, he should not be befriended. I once was friendly with and greatly helped a person, even though he did have triangular eyes and exposed nostrils. He constantly defamed me and tried to ruin me behind my back. As a result of his slander he developed terminal cancer. Even in death, however, he could not stop comparing himself with others. Not long ago Dharma Master Ts’e Hang in Taiwan left instructions that his corpse be placed in a large crockery jar and sealed for three years, after which the jar was to be opened to see if the corpse was in good condition, in which case it was to be gilded. The Dharma Master with triangular eyes in Hong Kong gave instructions for the same thing to be done for him, but only one day after his death his head had already fallen over to one side. If one has some spiritual skill, his head will remain upright when his body is placed in a sitting position after death and will stay there for quite a long time. Needless to say, the Hong Kong Dharma Master’s disciples did not open his jar after three years. They knew what they would find. For men it is appropriate to have a large mouth, but with women this is not the case. No matter how good a person she may be, the husband of a woman with high cheekbones and a large mouth will die young. From looking at the features, an entire life may be known; one can see the progress from youth to middle age and on to old age. Physiognomy has been studied deeply by the Chinese. A good example of a full physiognomy is Cardinal Yu Pin, whose features are full and complete. It is unfortunate that he has gone down the wrong road, for if he were a Buddhist, he would certainly have become an inconceivable Dharma Master. 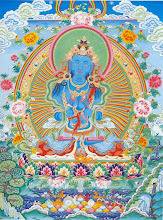 One obtains full and complete features from having worshiped Earth Store Bodhisattva. When the sutra says that a woman will be born upright and with full features, it means that all her features will be in harmony with one another. If the eyes are good but the nose is not, she cannot be said to have full features. If one ear is large and the other small, if eyes and nose are complete but the ears are not good, her features are incomplete. The features should also be well balanced on the face and not crowded together in the middle. When the features are thus balanced and all the parts are well formed, it is a result of having worshipped Earth Store Bodhisattva. “Moreover, Universally Expansive, if a good man or woman is able to play music, sing, or chant praises, and make offerings of incense and flowers before that Bodhisattva’s image, and is able to exhort others to do likewise, both now and in the future that person will be surrounded day and night by hundreds of thousands of ghosts and spirits, who will even prevent bad news from reaching his ears, much less allow him to suffer accidents. 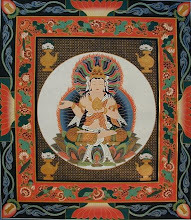 If anyone is able to sing, hum, or chant praises of Earth Store Bodhisattva, he will be surrounded by Dharma Protectors who will avert calamities such as airplane crashes, automobile wrecks, and so forth. Those who believe in the Buddha should not fear ghosts, since ghosts must bow to those who have cultivated merit. Of course, if one does not do meritorious deeds, there will be no protectors, and anything might happen. “Moreover, Universally Expansive, in the future evil men, spirits, or ghosts may see good men or women respectfully making offerings and praising, beholding, and worshipping Earth Store Bodhisattva’s image. These evil beings may wrongly express ridicule and malign the acts of worship as profitless affairs devoid of meritorious qualities. They may bare their teeth in laughter, slander them behind their backs, and exhort others to do likewise, whether one person or many, or they may even bear just one single thought of slander. Such beings will fall into and remain in the Avici Hells, undergoing the utmost misery as retribution for their calumny, even after the nirvana of the thousand Buddhas of the Auspicious Aeon. After that kalpa they will be reborn among the hungry ghosts, where they will pass a thousand aeons before being reborn as animals. After another one thousand aeons, even though they may again attain a human body, they will be poor and lowly, with incomplete organs, and their many evil deeds will bind up their minds. Before long they will fall into the Evil Paths again. Universally Expansive, such are the retributions that will be undergone by those who ridicule and slander others’ offerings. How much worse will it be if they have other evil and harmful views. Evil spirits are inveterate troublemakers. Some of them go to temples, impersonate the presiding deity, and receive offerings. 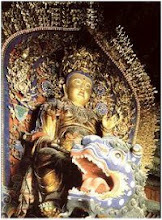 In the temples of Kuan Kung for example, Kuan Kung is not present at all times. While he is gone, the evil spirits may come and cause people to make flesh and blood offerings. Evil ghosts are primarily Kumbhandas, although there are others. 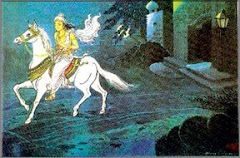 The Kumbhandas are large, melon-shaped beings who are also known as nightmare ghosts, because they enjoy sitting on sleeping persons, who wake up terrified and unable to move. In addition to these, there are other small evil ghosts who lodge in plants and trees, where they manifest their powers and cause people to believe in them. People who are sick might go to such a tree and offer incense in hope of a cure; if they have lost things, they might ask a certain tree to help retrieve them. When the response they sought occurs, people think that the tree has brought about a miraculous intervention on the part of some Bodhisattva, and will often sacrifice chickens, pigs, or other animals as offerings to the tree, not knowing it is inhabited by an evil ghost. The tree at Nan Hua temple, which took refuge and received the precepts from the Venerable Master Hsu Yun, was an example of such a phenomenon. A great many strange events occur in this world. 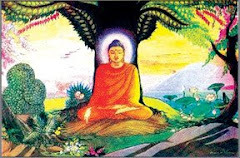 For those who do not understand Buddhadharma it is very easy to think that a miraculous response has been obtained from a Buddha or Bodhisattva, but those who understand these matters clearly realize that not every response is a sign of the Buddha’s aid and are not taken in by evil ghosts and spirits. When they exhort others to do likewise, they say things like, “There is no point in reciting sutras, no benefit is derived from listening to lectures on Dharma, and there is no interest at all in reciting mantras. Don’t bother with that, just take a bit of this fine drug and you’ll end up in the Land of Ultimate Bliss.” Their rationalizations are common in the world and are not rare even within Buddhism. Since a person who behaves like this can’t break the rules of proper conduct by himself and get away with it, he gets others to join him for support. Thus when called on their behavior, they claim that they are not alone, and that everyone else does the same thing. 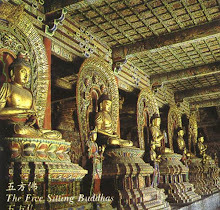 The aeon in which we live is called Auspicious because it has one thousand Buddhas, of whom Sakyamuni is the fourth. As can be imagined, the time required for the remaining nine hundred and ninety-six Buddhas to come into the world and enter extinction is long indeed. For those who will receive the retribution for slander in the Avici hell, one of our days and nights constitutes sixty small aeons. As mentioned above, fifty of our years make one day and night in the Heaven of the Four Kings, and one hundred of our years make a day and night in the Trayastrimsa Heaven. The reason for these differences is that when one is feeling happy, time seems to pass quickly, but when he is suffering or unhappy, minutes seem like hours and hours like days. Because the sufferings in the hells are so intense, time passes extremely slowly. After aeons of suffering in the Evil Paths, those who have slandered are born into poverty. Poverty is not caused by conditions in this life alone but is retribution for deeds done long ago. The solution to this problem lies not in putting people on a welfare dole but in teaching them to do good and to cease doing the kinds of deeds that get them into such a destitute position in the first place. Merely doling out money will not correct the essential cause of poverty. True welfare lies in teaching people to respect the Buddha and to refrain from slandering the Triple Jewel. When the Buddha, Dharma, and Sangha are in the world, there is an opportunity to plant merit and avert the causes of poverty. No matter what the conditions are something bad always occurs to those who have slighted the Triple Jewel. If they are not without food, then they have no clothes or shelter, and before long they commit offenses and fall back into the states of woe. Earlier the sutra mentioned a person who was reborn with a lifespan of only thirteen years, after which he was to have fallen into the states of woe again. This is an example of what is being discussed here. Are the periods of time mentioned in this passage definitely fixed: that is, will such persons really have to spend a thousand aeons as hungry ghosts and as many among the animals? These various retributions were made clear by Sakyamuni Buddha and are certain. There are, however, mitigating circumstances. A hungry ghost who resolves his thoughts on compassion and acts as a protector for someone who is cultivating is an example. Ghosts may also see someone cultivating and decide to undertake the practice of bowing to the Buddhas. Because such ghosts plant good roots while they are still suffering for their offenses, they may escape some time in the realm of ghosts, and be reborn as animals or even as humans. Animals who live near cultivation – those who live on temple grounds, for example – may gradually become permeated with Buddhism and come to have faith in the Buddha, thus lightening their karmic obstacles. When the Venerable Master Hsu Yun was at Nan Hua temple, a chicken followed along with the monks as they circumambulated the Buddha. After three years of such practice it stood before the Buddha and went off to rebirth. Although these states of retribution are undergone for fixed periods of time, there are always special circumstances that may alter the normal course of retribution. People who come to realize that their poverty, low stature, and handicaps are a result of not having respected Earth Store Bodhisattva and of having slandered the Triple Jewel may change their ways. They may undertake the practice of vegetarianism and recitation of the Buddha’s name, or they may even leave home to become bhiksus. Such persons will not necessarily have to return to the states of woe. Although the Buddhadharma contains principles, it is totally alive, not fixed and dead; therefore, it is necessary to look at each particular case to see what special conditions there may be. If someone guilty of offenses repents and reforms his conduct, it is not certain that he will have to fall into the states of woe. “Moreover, Universally Expansive, in the future men or women may be bedridden with a long illness and in spit of their wishes be unable either to get well or to die. At night they may dream of evil ghosts, of family and relatives, or of wandering in dangerous paths; in numerous nightmares they may roam with ghosts and spirits. As these dreams continue over a period of days, months, and years, such persons may weaken and waste away, cry out in fitful sleep, and be depressed and melancholy day by day. All of this is due to an unresolved degree of severity of their evil karmic paths, which make it difficult for them to die and difficult for them to be cured. The eyes of common men and women cannot distinguish such things. This passage does not refer to ordinary illnesses, but to chronic and crippling diseases. Those who are handicapped by such illness may wish to die and be relieved of their suffering, but cannot do so; they may wish to be cured and restored to a healthy life, but that too does not occur. In their dreams such people may consort with evil ghosts and practice a variety of unclean and evil deeds. The more numerous these deeds, the worse the illness becomes. What is more, they may see their deceased relatives in dreams, an inauspicious sign. At the door of every household there are protective spirits who will allow those under their protection to enter the home. When evil ghosts wish to molest the living, they are unable to get past the guardians of the door and so they tag along with a dead member of that family and thus sneak into the household. Seeing dead relatives in dreams is an inauspicious sign because, even though the relatives themselves are not coming to do the living any harm, they are followed by their friends, among who may be some very malevolent ghosts. These ill persons may also dream of walking high in the mountains in an area given to sudden landslides or on a road infested with wolves, tigers, and monsters. They may be attacked by Kumbhanda ghosts who render them incapable of movement or sound so that they just lie paralyzed and terrified as if entrance in some demonic samadhi. These attacks may occur several times in a single night. The victims may even know that they are dealing with ghosts, yet in their dreams they may roam about and play with them, because in dreams they frequently do not know enough to be afraid. Those who have this illness may become emaciated, consumptive, and racked with pain and spasms, and be always on the verge of tears. All of this is because the offenses which they have committed are numerous, and although they are not yet dead, their retributions are being determined in the hells. 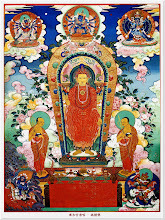 “In this instance this sutra should be recited once in a loud voice before the images of Buddhas and Bodhisattvas, and possessions which the sick one loves, such as clothing, jewels, gardens, or houses, should be offered, saying in a voice before the sick person, “I, so and so, before this sutra and image, give all these items on behalf of this sick person.’ Making offerings to the sutra and images, making images of Buddhas and Bodhisattvas, constructing temples and monasteries, lighting oil lamps, or giving to the permanently dwelling may be undertaken in a like manner. “The sick person should be told three times of the offerings that are being made so that he may hear and know of them. If his consciousnesses are separated and scattered and his breath exhausted, then for one, two , three, four, and on through seven days, this sutra should be read aloud in a clear voice. When that person’s life is gone he will achieve eternal liberation from all the heavy and disastrous offenses committed in his life, even the five offenses that receive uninterrupted retribution. He will always be born in a place where he will know his past life’s; much greater will the beneficial retributions be if a good man or woman writes this sutra out himself, teaches others to do so, carves or paints images himself, or teaches others to do so. All the properties mentioned in the sutra may be sold and the proceeds used to construct images of Buddhas and Bodhisattvas – acts productive of extremely great merit. When the announcement of the offerings is made, those who are performing them on behalf of the sick person should insert their own names where the text says, “I, so and so.” The announcement is to be made three times so that the sick person knows what is being done. The reference at the end of the passage to teaching others to do so means to solicit funds for the sake of making images. “Therefore, Universally Expansive, if you see a person reading and reciting this sutra or having a single thought of praise and respect for it, you should employ hundreds of thousands of expedients to exhort him to be energetic and not retreat. In both the present and the future he will be able to obtain thousands of tens of thousands of millions of inconceivable meritorious virtues. “Moreover, Universally Expansive, when dreaming or dozing, living beings in the future may see ghosts, spirits and other forms that are either sad, weeping, or worried, fearful, or terrified. These are all past fathers, mothers, sons, daughters, brothers, sisters, husbands, wives, and relatives from one, ten, a hundred, or a thousand lives, who have not yet been able to leave the Evil Paths. They have no place from which to hope for the power of blessings to rescue them, and so they plead with their flesh-and-bone descendants to establish expedient devices for them so that they might leave the Evil Paths. Universally Expansive, using your spiritual power, you should cause all these descendants to recite this sutra with sincerity before the images of Buddhas or Bodhisattvas, or to request others to recite it, either three or seven times. When the sutra has been sounded the proper number of times, relatives in the Evil Paths will obtain liberation and never again be seen by those who dream or doze. The term “doze” refers here to the state between ordinary wakefulness and sleep, just on the edge of sleep. The term “dream” refers to a number of classes of dreams: those that come from ignorant habits, those that contain prognostications of good or evil, those that are caused by an imbalance of the four elements, and those that are remembrances of things past. The first of these classes of dreams is caused by confused and obscure habits. Because such dreams are unclear, they are not remembered when one awakens. The second consists of those in which some foreknowledge is attained and warnings of impending events, either good or bad, are given. 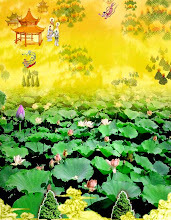 The Venerable Hsu Yun’s dream in which the Sixth Patriarch said “Come back, return, there is yet work to do,” is an example of such a dream; in fact, it turned out to be a dream calling him back to Nan Hua Monastery to restore the temple. Sometimes warnings are found in dreams, warnings to avoid doing certain things lest the person encounter accidents. Because people ignore such warnings they end up getting hurt. The third class of dreams arises from an imbalance of the four elements. According to Chinese medical study, there are four hundred forty kinds of diseases and eight hundred eighty cures. In Buddhism it is said that there are eighty-four thousand dharmas, which are prescriptions to cure as many illnesses. If any one of the four elements becomes predominant, a corresponding illness arises, and there may be dreams in connection with the illness. The fourth class of dreams is that which is based on remembrance of past things. During the dream the dreamer sees old friends and old places, but when he awakens it is all seen to have been unreal and a dream. There are many kinds of ghosts that may occur in dreams: some with flaming red hair, protruding teeth, and elephant tusks; some weeping and wailing, with running eyes and dripping noses; some in the form of friends and relatives who seem distraught and worried; and other forms as well. Some ghosts are parents and relatives from past lives, and for this reason all living beings should be regarded as one’s past parents and as future Buddhas. One who regards all beings in this way will never bother a single being, for he sees them all as his own parents. Ghosts who are seen in dreams such as the ones mentioned above have done bad deeds and fallen into the states of woe. They have no one to help them by reciting sutras or doing other similar meritorious acts. It is for this reason that there exists the Buddhist custom of reciting sutras for the benefit of either the living or the dead. Those for whose sake the act is being done receive merit in this way and can be freed from the states of woe. If a descendant of ghosts wishes to read this sutra for them but is unable to do so for some reason, he may hire others to do the reading for him. 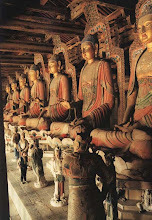 In any case, the sutra should be recited three or seven times. These are odd numbers and belong to the yang, whereas even numbers are yin. Thus the reading of the sutra a yang number of times signals the breaking up of karmic obstacles in the hells. “Moreover, Universally Expansive, in the future, lowly people, bondsmen, serving maids, and others who are not independent may be aware of their past deeds and wish to repent of them and to reform. They should gaze at and worship Earth Store Bodhisattva’s image with a sincere heart for seven days and recite his name a full ten thousand times. When their current retribution ends they will be born into wealth and honor, and throughout thousands of tens of thousands of lives they will not pass through any of the sufferings of the Three Evil Paths. There are five basic reasons for which people are born into poverty. The first of these is arrogance, particularly toward one’s parents. The second is obstinacy that is, refusing to listen to teachers and elders. The third is lack of diligence in honoring the Triple Jewel. The fourth is thievery. There are a great many people who rob from others when they themselves have no money. They use their ill-gotten gains to eat, drink, and make merry, to keep themselves in wine and drugs. When the money is gone they go out and steal again. As a result, they are reborn in extremely low and servile positions. There are also five causes that lead to rebirth in wealthy and honorable families. The first of these is compassionate giving. The second is respect for parents and teachers. It is totally wrong for people to talk about how they hate their parents, how their parents restrict and hamper them, and how their parents are stupid. It is also wrong to bow to a master and then talk about him behind his back. Treating parents and teachers this way is to commit offenses that make it impossible to be reborn in a good family. The third cause of birth into wealth and honor is worship of the Triple Jewel. The fourth is patience and lack of anger. When one is scolded the best thing is to be happy, pleased, and not in the least upset. This is a difficult undertaking, for it is not always easy to be patient and to be polite to everyone. The fifth cause is listening to sutras and vinaya, which is to say, attending lectures on sutras and studying and practicing the moral precepts. While the ideal is to have all five virtues, the practice of even one will keep you from being born in a servile and lowly position. 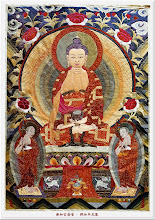 Moreover, Universally Expansive, if in the future in Jambudvipa there are Ksatriyas, Brahmans, elders, upasakas, and others of various names and clans who have newborn sons or daughter, they should recite this inconceivable sutra and recite the Bodhisattva’s name a full ten thousand times within seven days before the child’s birth. If that newly born child was to have had a disastrous life, he will be liberated from it and be peaceful, happy, easily raised, and long-lived. If he was to have received a life of blessings, his peace and happiness will increase, as will his lifespan. This passage particularly mentions Jambudvipa, our continent. The process of birth and death is not the same in all places. In Uttarakuru, for example, people are born under trees. It is a very simple matter; the mother merely goes beneath a tree and, like a hen laying an egg, gives birth to a child. In the eastern continent, Purva-videha, and in the western continent, Apara-godaniya, there are relatively few births, since those who live there have comparatively little desire. In our continent, many beings are born, and birth is usually quite painful for the mother. In some cases the child may be born upside down, or be difficult to bear because of a breech birth. In another case, called the “plucking lotus birth,” only one foot emerges at the beginning of birth; in another the womb is pulled out along with the child. In general, birth is a difficult experience. The elders mentioned in the text need not belong to either of the noble castes, but they do have wealth and blessings. Because the recitation of this sutra and of Earth Store Bodhisattva’s name can cause those who should receive a disastrous life to be easily brought up and long-lived, we can see that the lifespan is not a predetermined and fixed thing. If good is done, the lifespan will increase; if evil is done, it will diminish. Everything depends on what the individual himself does. “Moreover, Universally Expansive, on the first, eighth, fourteenth, fifteenth, eighteenth, twenty-third, twenty-fourth, twenty-eighth, twenty-ninth, and thirtieth days of the month, the offenses of living beings will be gathered together and judged. 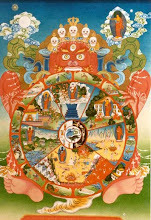 Since almost every single movement or stirring of thoughts on the part of the living beings of Jambudvipa is karma and an offense, how much more likely are they to incur offenses when they actually give themselves over to killing, stealing, sexual misconduct, and false speech. If they are able to recite this sutra before the images of Buddhas, Bodhisattvas, or sages once on these ten days, there will be no disasters for one hundred yojanas to the north, south, east, and west. Those in their families, both old and young, now and in the future, will be apart from the Evil Paths throughout hundreds of thousands of years. If they can recite it once on each of these ten vegetarian days, there will be no accidents or illnesses in the family and there will be food and clothing in abundance. On the ten dates mentioned in the sutra text, the various ghosts and spirits go over the deeds done by beings and determine the virtue and sinfulness of each. Even if one merely has thoughts of committing offenses he is, in effect, committing those offenses; how much heavier is his offense karma if he actually does those deeds of killing, stealing, lying, and sexual misconduct. The last of these is one that Westerners are prone to consider a very minor matter, but it is well to be aware that it is classed as an offense; it is the one living beings are most likely to commit. The text discusses recitation of this sutra on the ten vegetarian days, fixed dates on which vows of abstention from unclean foods are practiced. Coarse delusions are deluded views; fine ones are the delusions of thought; and those as numerous as dust and sand are the delusions of ignorance. It may be objected by some that they have studied sutras for a long time but do not feel as though their obstacles have been overcome. Such a thought is in itself a sign that those obstacles have already started to disappear. If they were not being eradicated, you would not even know that you had such problems, since you would still mistake your afflictions for precious gems and would not want to be rid of them. When the text mentions five words, it refers to the disintegration of the Five Dwellings. The first of these is dwelling in the affliction of views and love. Because there are views, there is also a love which arises for that which is viewed. The second is dwelling in the affliction of desire and love. Because of desire there arises love and, consequently, afflictions. In people who are devoid of love there is no hate, and without hatred, there are no afflictions. The third is the affliction of dwelling in form and love, which arises when love occurs with respect to form. The fourth is the affliction of dwelling in formlessness, and the fifth is the affliction of dwelling in ignorance. Hearing one verse or even a sentence of principle from this sutra can cause you to leave through the One Door and enter the Miraculous Adornment Road. Hearing one sentence can cause you to attain the complete brightness of the One Nature. To explain these principles fully would take many words; I am only giving you their names, for they will be explained more carefully in the future. People’s appearances are not always proper and their features are not always put together harmoniously. For example, some may be born with a monkeylike hand, with horse-like nostrils, or with rat-like eyes. There is a Chinese proverb that says, “A rabbit’s head and a serpent’s eyes, ears like a rat and a vultures beak.” A person with these features does not have a proper physiognomy; his face resembles many animals moving together to form a whole. What we are talking about here is achieving a proper and organized physiognomy. People can also be born wealthy as a result of their virtuous conduct. On the other hand, those who are not wealthy, who are poor, lowly, and servile, have slandered the Triple Jewel. The Buddha said, “This sutra has three names: the first is the Past Vows of Earth Store Bodhisattva; is also called Earth Store’s Past Conduct; and it is called Earth Store’s Fundamental Power of the Way. 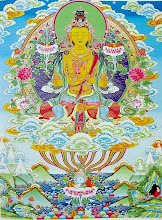 Because this Bodhisattva has made such great vows over so many aeons to benefit and profit living beings, you should all propagate the sutra in accord with these vows. After Universally Expansive heard this he placed his palms together respectfully, made obeisance, and withdrew. There are two styles of kneeling. In the first, one sits on his left leg, which is placed under the body. The second method is ordinary kneeling with both knees on the ground and is known as “long kneeling” because it is a position that can be maintained for some time; the former style can be maintained only for relatively short periods. 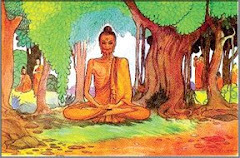 The Buddha said that because of the difficulty of the former position, women should kneel with both knees on the ground but men should use the other method. In Burma, Ceylon, and other countries, young bhiksus kneel when they see other bhiksus, and sramanera kneel whenever they meet any bhiksu. They keep their eyes downcast and do not look at the bhiksu’s face. From the three names given to this sutra we can realize the importance of the conduct of Bodhisattvas who make and practice great vows, even to the extreme of giving one’s head if it can benefit beings, but not giving a hair of the body if it will cause harm. The sutra should be propagated and spread throughout the world, in accord with such vows and practices.